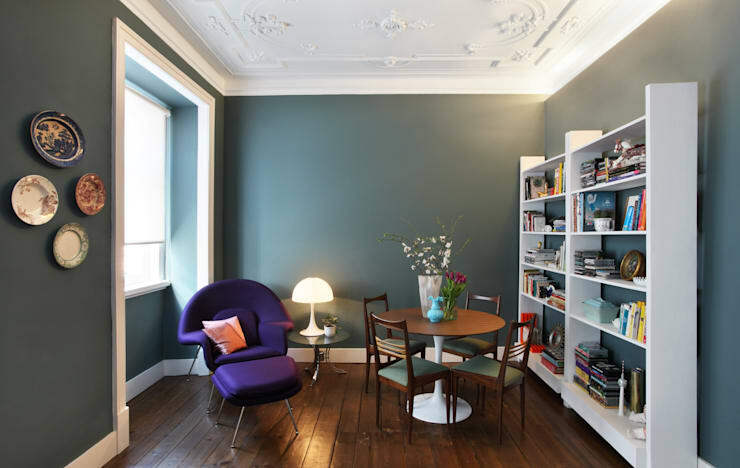 Today on homify we travel to Portugal, where we will explore an intriguing vintage-style home. Like many older-style apartments in southern Europe, it was designed with lots of small rooms. Interior architects Tiago Patricio Rodrigues refreshed the design, installed a new en-suite bathroom and decorated the interior with a combination of vintage furnishings. Many of our readers might be surprised to discover some inspiration here on how to deal with small spaces in a modern home. So come with us on a photo tour. This is an apartment like no other! In the very centre of the apartment lies this dining room. It's an unusual space in that it has no windows and also functions as a transit point for the bedrooms to the ride, the kitchen on the far left and the living room behind us. The architects have used this partial wall on one side to create a passageway. It very effectively separates the space from the dining room without closing up the area too much. Open-plan layouts are almost the default choice these days. But this cosy living room is so beautiful that it may make some readers nostalgic for the old days. 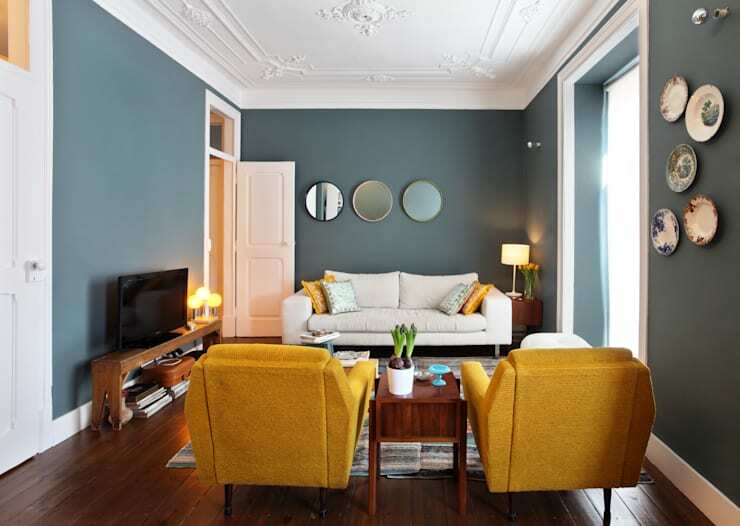 It has very elegant blue-grey walls in a subdued hue that really works with the mustard furnishings and accents. Note the collection of round antique mirrors that decorate the walls. This little living room would make the perfect reading nook. It has a single armchair, a great white bookcase and a footstool to boot. We love the little round table. This kind of table is perfect for interiors with limited space. The home has a very eclectic collection of furnishings. In the bedroom here we have an antique gold chandelier. This style of light fitting is often seen with heavy, solid and conventional furniture. But the designers have instead chosen to team it with a modern artwork and two wooden chairs in place of side tables. It's a delightfully eclectic approach that refuses to fit into any one style. 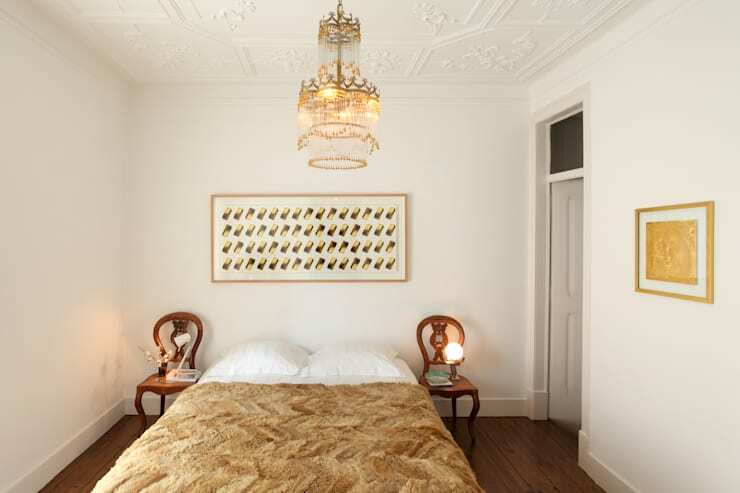 Keen-eyed readers may have noticed the gorgeous ornate plaster ceiling in the bedroom. Here we have a really interesting view of how the architects sought to retain this element in the construction of the new en-suite bathroom. The upper portion of the wall is made from glass! 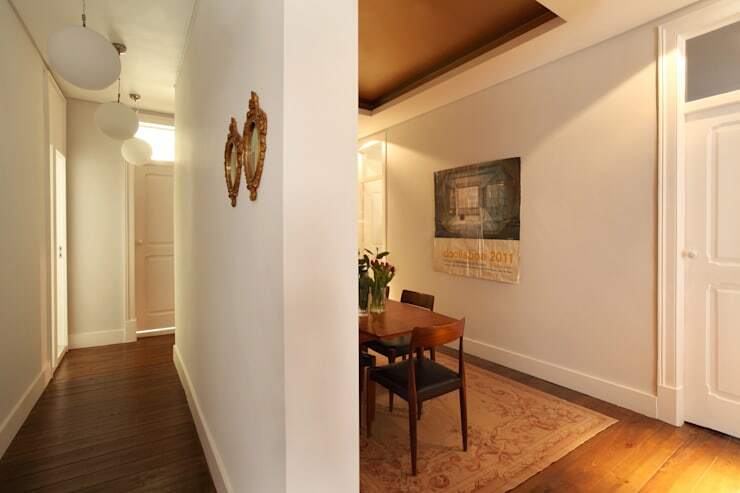 This doesn't just allow the lines of the original ceiling design to remain uninterrupted. It also allows light to flood into the windowless bathroom. 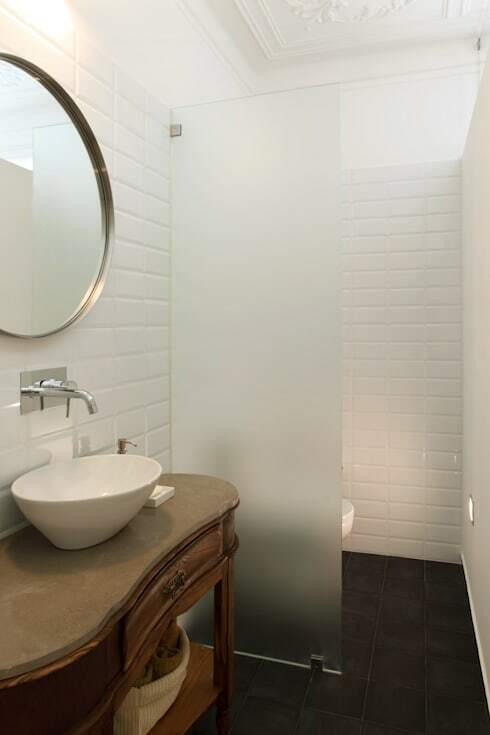 The unique combination of modern and retro elements is present in the little bathroom too. Many antique lovers draw the line when it comes to the design of their bathroom. But here we have a very careful combination of old and new. The shower room is modern, but the vanity has been constructed out of an old upcycled wooden table. The kitchen is quite narrow, but it has a very clean, functional and open ambience. 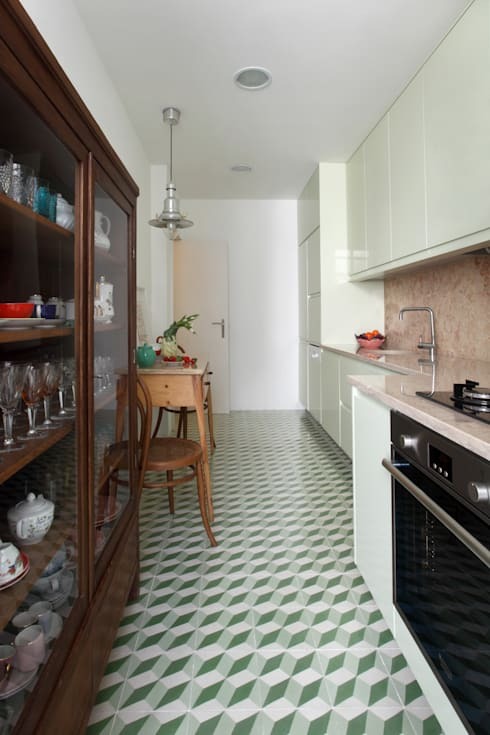 We love the green geometric floor tiles. They add a real retro vibrancy to the room. Finally, note the very narrow table pushed against the wall. This was a common way to furnish small kitchens in past times and it's one that still works! If this project got you thinking about creative ways of separating your living areas, you'll love this Ideabook 7 inventive ways to divide your space. What do you think of this vintage-style home?